When I think of beach reads I imagine books that are easy to immerse yourself in, have a bit of humor in them, are relatively quick reads, and are mostly just light and fun. Not all of these books fit the description, but still. I also looked at my beach reads list from last year and tried not to pick the same books. By 'beach read' I think I'll generalize it to a summer/holiday/light-hearted/fun/friends/romance read :) Though they're not all typical contemporary as I'm not reeeeeally a contemporary girl. Hey I have read most of the books so I'd say awesome list. I am currently reading school spirits. :) I can't wait to read The moon and more. I love your choices, Vampire Academy and Pushing the Limits are my favourites. Great list! I agree that Sara Dessen = summer/beach reading! Thanks for stopping by my list! Ooooh, some of those in the second list especially sound really good! And the to-read list expands. I love that you have Vampire Academy on your list… Those are good reading anyway! :-) I've been wanting to read The Ghosts and the Goth for a while now and am glad to see some of the titles you put it up there with – it definitely looks like the book I will like. Thanks for stopping by! Along for the Ride is one of my favorites! My other favorites by her are This Lullaby, Just Listen, and What Happened to Goodbye--all great summer reads! Good list, I love the Wolves of Mercy Falls series as well. I like your lists! I'd love to read the Sarah Dessen and Gayle Forman books! I just in the last year experience both authors and I love them! 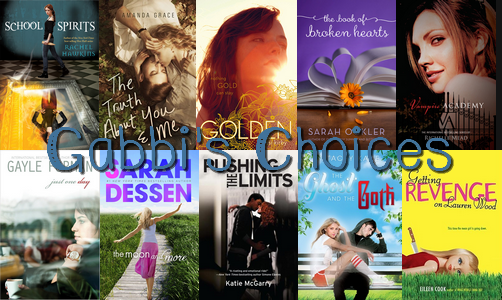 So many awesome books on your list! I really want to read some Sarah Dessen this summer. Everyone loves her books! And it looks like I need to pull up the old TBR list and add some of these to it! Great list Gabbi! Great lists!! I really want to read a few of these like Pushing the Limits, VA, Incarnate, and Everneath! 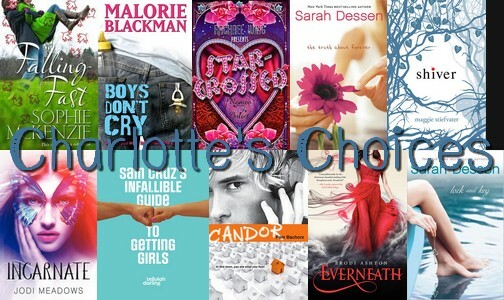 I've heard great things about almost all of these, and most of them are on my TBR, but I've read only Shiver & VA so far. Great lists! So many great titles! I can't wait to read Vampire Academy, I'm currently reading Shiver! I have only read 1 of the books on your entire post! But I do want to read a lot of them... Maybe I'll get a chance during my beach vacation next month! I've read Getting Revenge on Lauren Wood and Golden and they were great books. It looks like you have an awesome list. A lot of these titles are on my list as well. :) Great picks!